This is a close-up of the leaf stem of a sunflower. The small dark grey insects are aphids, which feed on the sap of the plant. The ants stimulate the aphids with their antennæ or forelegs to excrete a substance called honeydew which is rich in nutrients ants require. Each worker ant goes from aphid to aphid collecting honeydew which she stores in her abdomen until it's full, whereupon she returns to the nest and regurgitates to feed other members of the colony. 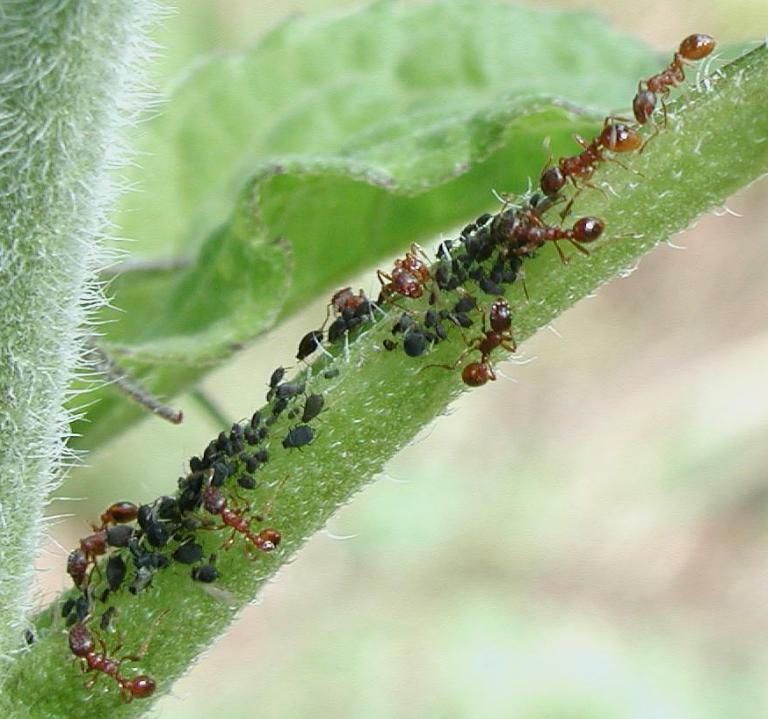 The ants, in return, protect the aphids from predators such as flies, wasps, and beetles. Indeed, the arthropod contingent at Fourmilab are not entirely unanimous regarding the use to which aphids should be put. This ladybird (Coccinella septempunctata) is munching away at aphids on a leaf near where the ants have their main ranch. An ant, to the left and slightly out of focus), is attempting (without apparent success) to harass the beetle and chase it away. The ants, like ranchers of our own species, sometimes move their aphids to richer grazing grounds. The ant ranch photo was taken by John Walker on July 6th, 2003 on the Fourmilab grounds with an Olympus C-3040 digital camera in macro zoom mode at f/5 and 1/100 second. The image was cropped from the original full frame, contrast enhanced, and slightly sharpened with The Gimp under Linux. 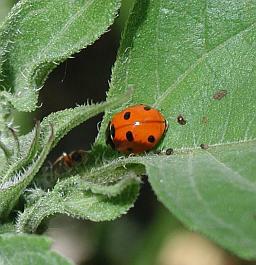 The photo of the ladybird was taken on July 13th, 2003 with the same camera and lens settings, but with automatic focus and exposure.